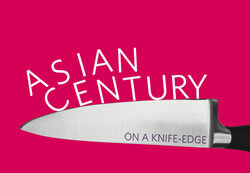 The world is awash with hype about the "Asian Century". Asia is projected to remain the world's fastest growing region during the 21st century, and recapture its dominant position of the world economy -- a position it held for millennia, until the Industrial Revolution two centuries ago. However, a close reading of Asia's situation suggests that the future is full of great risks and possible fractures. Japan's export-oriented growth model ran out of steam two decades ago. China is now challenged to rebalance from exports to domestic demand. India is learning that IT service exports alone are not sufficient to ignite a country's full development potential Asia's rapid urbanization has created some of the world's best cities, Hong Kong, Singapore and Tokyo, but also some of the worst, like Kolkata, Djakarta, and Dhaka. And too many Asian citizens are "excluded" from economic opportunity -- from women and youth to indigenous peoples and lower castes. Effective democratic governance has very shallow roots in Asia, a factor which will become a brake on growth. Apart from Japan, Korea and Taiwan, most of the region's governments are either fragile democracies or authoritarian regimes. Weak governance has also facilitated the rise of international economic crime like human trafficking, money laundering, counterfeiting and piracy, trade in drugs, and cyber-crimes. While cooperation between neighbouring countries is essential for peace and prosperity, the region is currently bristling with tensions due to lingering historical ill-feeling toward Japan, disputed borders between almost all Asian neighbours, and the growing conflictual relationships between China and its neighbours in the East and South East China Sea. While no one wants war, there is ample historical evidence to fear the worst. And in the global arena, Asia has still not made its mark effectively. We all have a stake in the possible Asian Century. It would not only improve the well-bring of many more people in the region, but also provide a boost to ageing Western economies, and other emerging regions. We have created this website and AsianCenturyInstitute as a forum to discuss and debate the challenges and opportunities of an Asian Century. We hope that it might make a modest contribution to the realization of the Asian Century, following America's 20th century and Britain's 19th century.